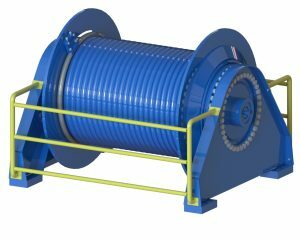 Grumsen Equipment spooling winches are designed to facilitate installation or removal of wire or rope from winches or storage reels under constant back tension. 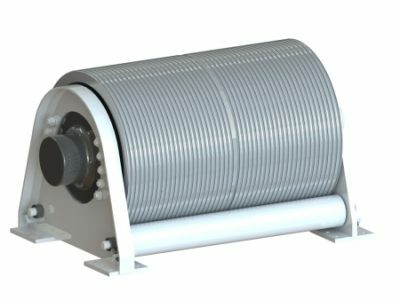 This winch is special developed in cooperation with our customer. It’s specially designed for our customers’ need of servicing liferafts on cruise ships. The winch’ function is to lower down liferafts in controlled speed, in time for service or emergency. 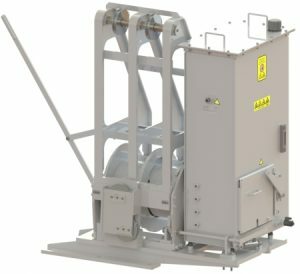 Electric, diesel or hydraulically driven slipway winches. 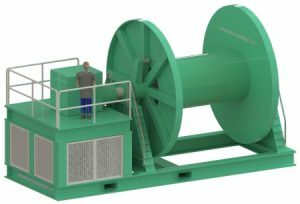 They can be designed and tailored around customers’ specifications and needs, which can include variations on wire capacity, spooling systems, braking, load sensing and control systems. 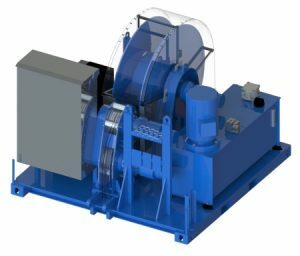 The Manriding Winch is built as a welded construction and is a single integrated unit, consisting of winch, level wind, pneumaticand hydraulic power unit and control equipment. The level wind is adjustable to any angle between horizontal and 5º from vertical. The system is equipped with an adjustable tension system, allowing the line pull to be adjusted to the necessary need, thus increasing the safety of the performed operation. The shown model consists of a pneumatic pump connected to a hydraulic motor. This particular model has been produced for the Norwegian offshore sector. 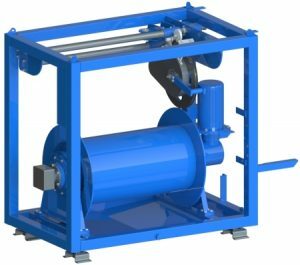 If requested – the Manriding Winch can be produced as a solely hydraulic powered unit. Two ropes or wire can be operated simultaneously with a centre flange on the drum. 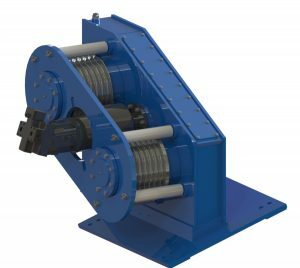 The Traction Winch is available in various configurations, to suit different types of wire, fiber or robes. 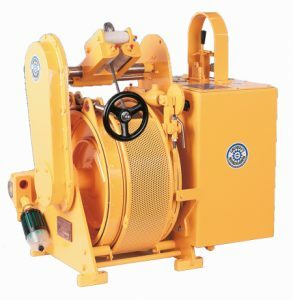 The benefit for this winch is that it will provide a constant pull, at a constant speed. It will be delivered with a hydraulic or electric drive system. Special designed for mobile cranes. 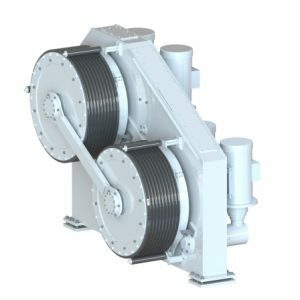 Special designed winch system that includes a traction winch, storage winch and hydraulic power unit.